Total temporomandibular joint (TMJ) replacement entails surgical replacement of the TMJ with a total joint prostheses as well as orthognathic surgery. TMJ disorders/pathology and dentofacial deformities commonly co-exist. The TMJ pathology may be the causative factor of the jaw deformity, develop as a result of the jaw deformity, or the 2 entities develop independent of each other. This chapter will focus on the most common TMJ pathologies that are indicated for TMJ total joint prostheses as well as orthognathic surgery. The health and stability of the TMJ is dependent on the structural integrity, position, and presence or absence of disease or injury affecting the articular disc, condyle, fossa, and associated soft tissues. The TMJ hard and soft tissue components may become degenerated, arthritic, and non-salvageable with any of these following TMJ pathologies; 1) Articular disc dislocation (long duration), 2) Adolescent internal condylar resorption (AICR), 3) Reactive arthritis, 4) Ankylosis, 5) Congenital deformation or absence of the TMJ, 6) Trauma, 7) Connective tissue and autoimmune diseases, 8) Previously failed TMJ surgery, and 9) Other end-stage TMJ pathologies.1-4 These TMJ conditions are often associated with dentofacial deformities, malocclusion, TMJ pain, headaches, myofascial pain, TMJ and jaw functional impairment, ear symptoms, sleep apnea, etc. Patients with these conditions may benefit from corrective surgical intervention including TMJ reconstruction with total joint prostheses, orthognathic surgery, and other adjunctive procedures. Many clinicians may have difficulty identifying the presence of a TMJ condition, diagnosing the specific TMJ pathology, and selecting the proper treatment for that condition. This chapter should improve the clinician’s diagnostic and treatment planning skills particularly in the end-stage TMJ pathologies requiring TMJ total joint prostheses. Although most TMJ patients have associated symptoms, approximately 25% of patients with significant TMJ pathology/disorders may be asymptomatic. These patients are diagnostically challenging when undergoing orthognathic surgery because the TMJ pathology may not be recognized or treated appropriately, resulting in a poor treatment outcome with potential redevelopment of the skeletal and occlusal deformity by condylar resorption or overdevelopment as well as initiation of worsening pain, headaches, jaw and TMJ dysfunction as well as other TMJ symptoms.5 However, there are clinical and imaging factors that can indicate the presence of TMJ pathology in the asymptomatic patient. Many clinicians choose to ignore the TMJ pathology and perform only orthognathic surgery for these types of cases, but this treatment philosophy can result in continuation or exacerbation of the presurgery TMJ pathology and reproduce the original deformity with worsening occlusion, jaw dysfunction, facial imbalance, and pain. Clinicians who address the dentofacial deformities and TMJ pathologies that require total joint prostheses can perform the surgery in 1 stage or 2 separate stages. The 2-stage approach requires the patient to undergo 2 separate operations and anesthesia, significantly prolonging the overall treatment. However, performing concomitant TMJ and orthognathic surgery in these cases significantly decreases treatment time, provides better outcomes, but requires careful treatment planning and surgical proficiency in the 2 surgical areas. In the author’s 25-year experience of using patient-fitted TMJ total joint prostheses, approximately 2/3rds of patients requiring total joint prostheses can benefit from concomitant orthognathic surgery for improvement in function, airway and breathing capabilities, better esthetic outcomes, and decrease or elimination of pain. 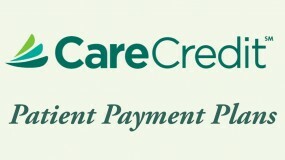 It is important to know the patient’s concerns, history, symptoms, and treatment expectations. We have previously published detailed information on patient evaluation for orthognathic, TMJ, and sleep apnea surgery including clinical, radiographic, MRI, and dental model analyses, 1-4,6 so this information will not be included here. However, it is important to realize that these patients are sometimes misleading in their clinically presentation because their “natural head position” may posture their head hyper-extended, lower jaw and chin tipped upward and forward to make the chin appear more prominent, but more specifically to open their oropharyngeal airway to improve their ability to breathe. If the patients are not evaluated with a proper corrected head position, the amount and degree of maxillary and mandibular retrusion and asymmetry may be missed: Thus the importance of evaluating the patient with the pupillary plane and ear plane parallel to the floor in the frontal view (Fig. 1 A), and clinical Frankfort horizontal plane (a line from the tragus of the ear through the bony infraorbital rim) parallel to the floor in the profile view (Fig. 1 B). Obviously there will be some variance in some individuals, but this is a basic guide. Common factors in patients requiring TMJ total joint prostheses that are frequently overlooked by clinicians, are: A-P deficient maxilla and mandible, decreased oropharyngeal airway, nasal airway obstruction, and sleep apnea issues. Patients with TMJ issues, particularly those with condylar resorption pathologies, may experience progressively worsening breathing and sleep apnea issues. Patients with sleep apnea symptoms may be indicated for a sleep workup including polysomnography. Radiographic evaluation is helpful in the diagnostic process, and cone beam computed tomography (CBCT) technology makes low-cost, low-radiation scans accessible. With CBCT imaging, the oropharyngeal and nasal airways can also be evaluated as well as the lateral and antero-posterior cephalometric images, TMJ tomograms, and panographic images. The lateral cephalometric analysis can determine the severity of the jaw deformity, dental alignment, airway dimensions, etc. One of the best diagnostic tools for TMJ disorders is magnetic resonance imaging (MRI) because it allows evaluation of TMJ disc position, morphology, mobility, extent of joint degenerative changes, inflammation, and the presence of connective tissue/autoimmune diseases. It can help in the diagnosis of TMJ disorders in the silent joint in which disc displacement and degenerative changes can be present, may not make noise or be uncomfortable or painful, but may contribute to poor outcomes if only orthognathic surgery is performed. CT scans, bone scans, three-dimensional (3D) imaging may be helpful in diagnosis and treatment planning. 3D modeling is necessary for manufacture of patient-fitted TMJ total joint prostheses. Magnetic Resonance Imaging (MRI) is one of the most important diagnostic tools that we have in evaluation, diagnoses, and treatment planning for TMJ pathology. In general, T-1 MRIs are helpful in identifying disc position, the presence of alteration in bone and soft tissue structures, and interrelationships of the bony and soft tissue anatomy. T-2 MRIs are more helpful in identifying inflammatory responses in the TMJ. The importance of disc position cannot be over-emphasized. For MRI evaluation of the TMJs, a 1.5 Tesla or more powerful machine is recommended. “TMJ Coils” are necessary to achieve diagnostic quality images of the TMJs. The basic views that are most helpful in diagnoses include: 1) Sagittal views in centric relation as well as in maximum opening. 2) Coronal views in centric relation. 3) Dynamic views, if available. The MRI imaging can be correlated to cone beam imaging of the TMJs for joint space and greater interpretation of bony pathology. Figure 2 shows a normal TMJ MRI with healthy structures and the disc in position. 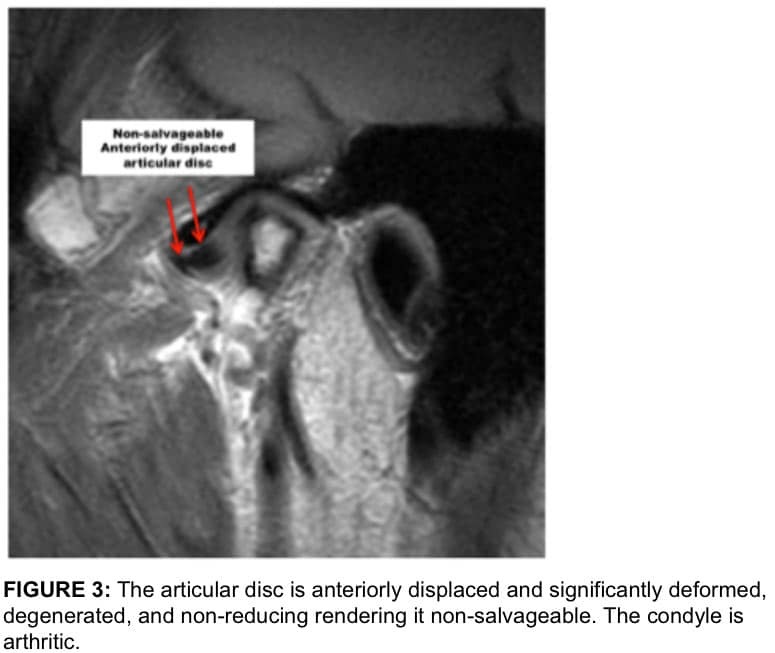 When discs are anteriorly displaced for an extended time period, the discs may become non-reducing, deformed with loss of the intermediate zone and thickening of the posterior and anterior bands (Figure 3). Also, there may be a degenerative process developing in the discs where there is a breakdown of the cartilaginous substance with vascular invasion and degeneration. When discs are displaced and become non-reducing the degenerative process of the disc progresses more rapidly as compared to displaced discs that reduce. When discs advance to a certain level of deformation and degeneration, they become non-salvageable. When concomitant TMJ and orthognathic surgery is indicated, in this situation, patient-fitted total joint prostheses are indicated to produce to most predictable and high quality outcome. Adolescent internal condylar resorption (AICR) is a condition that develops usually during pubertal growth between the ages of 11 to 15 years, predominantly in females (ratio 8:1 females to males). 1-4,12,13 Clinically, the mandible will be noted to slowly retrude into a Class II occlusal and skeletal relationship with a tendency towards anterior open bite. These patients all have high occlusal plane angle facial morphological profiles. On the MRI, these cases present with a condyle that is slowly becoming smaller in size in all 3 planes of space and the disc is anteriorly displaced similar to Figure 3. In some cases, there is significant thinning of the cortical bone on top of the condyle contributing to the inward collapse of the condylar head in this pathological process. The articular discs are anteriorly displaced and may or may not reduce on opening. Non-reducing discs will degenerate and deform at a more rapid rate as compared to discs that reduce. Our studies demonstrate that AICR is arrested if the articular discs are put back into position on top of the condyle and stabilized with the Mitek anchor technique. Results are best for AICR if the TMJ surgery for disc repositioning is performed within 4 years of the onset of the pathology. After 4 years, the discs may become non-salvageable and condyles significantly resorbed with the indicated treatment being patient-fitted total joint prostheses to repair the TMJs and advance the mandible. Reactive arthritis is commonly caused by bacterial or viral entities 1-4,14-19 and may show a localized area of inflammation with erosion of the condyle and/or fossa. It also can present as a more profuse inflammatory process through the bilaminar tissues, capsule, etc. (Figure 4). Surgical indication may include removal of the nidus of inflammation and reposition the articular disc if salvageable. 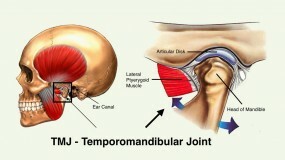 With extensive destruction of the TMJ, a total joint prosthesis is indicated. Perforations can occur in the TMJ area resulting in bone-on-bone contact. For perforations the discs are usually anteriorly and/or medially displaced. Almost always these perforations are posterior to the posterior band of the articular disc or lateral to the disc and rarely do perforations occur through the disc itself. 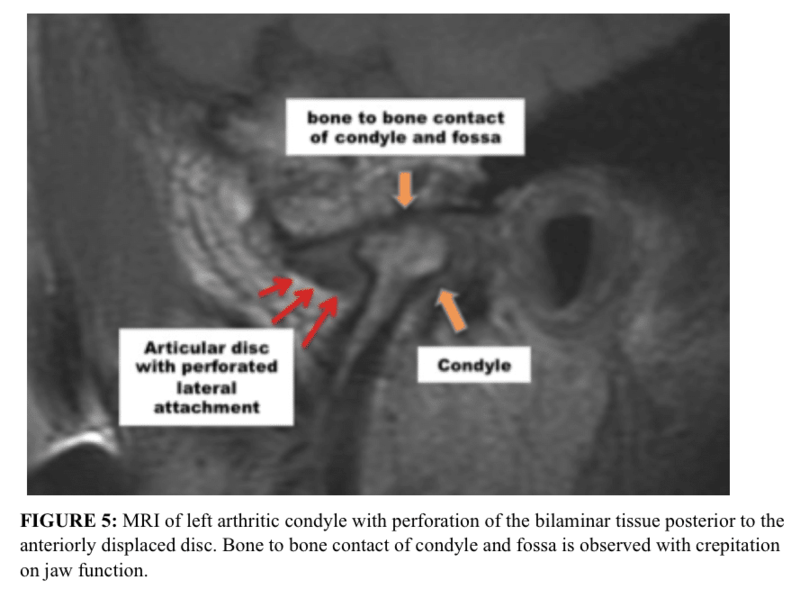 (Figure 5) Clinically, crepitation will usually be present and, on the MRI, there will be evidence of bone-on-bone contact, arthritis of the condylar head and/or fossa, as well as anteriorly displaced disc. 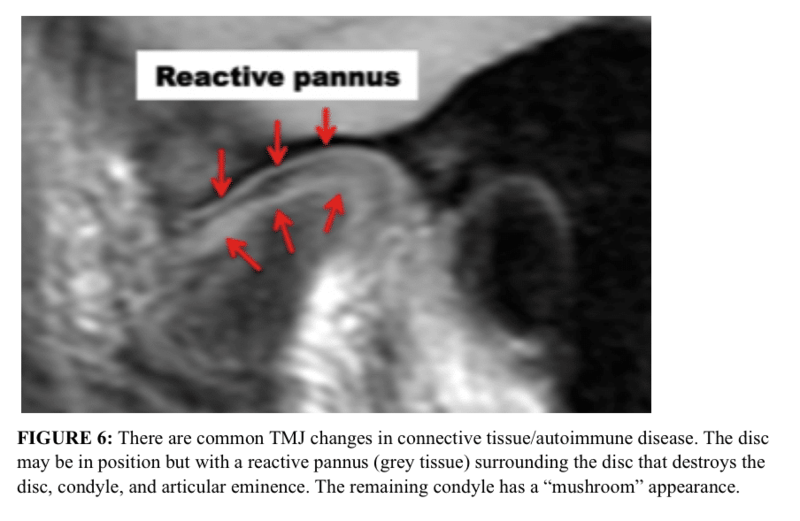 The MRI presentation of connective tissue/autoimmune diseases is fairly pathognomonic. In these conditions, the articular disc oftentimes is in a relatively normal position, but there is progressive condylar resorption, “mushrooming” of the remaining condyle and often resorption of the articular eminence, with slow but progressive destruction of the articular disc that is surrounded by a reactive pannus. (Figure 6) 1-4,20-24 This presentation almost always indicates the requirement of a total joint prostheses for jaw reconstruction to eliminate the pathologic process in the joint. Use of autogenous tissues in this scenario could result in the disease process attacking autogenous tissues placed into the joint with subsequent failure. Cephalometric analysis is an important assessment for diagnosis and treatment planning for TMJ patients because the most dominant facial type that experiences TMJ pathology is the high occlusal plane angle facial morphology with a retruded maxilla and mandible. Normal cephalometric relationships used by the author are demonstrated in Figure 7), and are described in detail in previously published papers 3,6. One of the primary factors contributing to sleep apnea is a decreased oropharyngeal airway and is commonly seen in TMJ patients, particularly with a history of TMJ condylar resorption. The normal cephalometric A-P dimension from the posterior pharyngeal wall to the soft palate and posterior pharyngeal wall to the base of the tongue should be 11 mm, plus or minus 2 mm. In patients who have a retruded maxilla and mandible, this airway may be significantly decreased. Accompanying these deficiencies is usually a high occlusal plane angle. The normal cephalometric angle of the occlusal plane to the Frankfort horizontal plane is 8 degrees, plus or minus 4 degrees. Commonly with a retruded maxilla and mandible (particularly with condylar resorption), the occlusal plane is significantly increased and is a factor to be addressed in the treatment planning. There is a triad of factors that commonly go together in TMJ patients and they include: 1) A high occlusal plane angle facial morphology associated with retruded maxilla and mandible, 2) Nasal airway obstruction related to hypertrophied turbinates and/or nasal septal deviation or spurring, and 3) TMJ pathology. Our recent study 25 evaluated 1234 consecutive patients referred to the author for orthognathic surgery requiring at least maxillary osteotomies. There were 603 patients (49%) with hypertrophied turbinates requiring partial turbinectomies and 278 patients (23%) required nasal septoplasty. For patients requiring partial turbinectomies (n = 603), 84% had maxillary hypoplasia, 72% had mandibular hypoplasia, 69% had a high occlusal plane angle, and 49% of the patients required concomitant TMJ surgery. A female predominance was seen in the data reviewed. Approximately 67% of the turbinectomy cases and 73% of concomitant turbinectomy, orthognathic, and TMJ surgery cases, involved female subjects. A strong correlation has been established between hypertrophied inferior turbinates, hypoplastic maxilla and mandible, as well as a steep occlusal plane. Our findings correlate with other studies evaluating the morphology of mouth breathing and nasally obstructed patients. 26–29 Therefore, patients with the high occlusal plane angle facial morphology with a retruded maxilla and mandible should be assessed for nasal airway obstruction, decreased oropharyngeal airway and sleep apnea, as well as TMJ pathology (even if asymptomatic). Following completion of all necessary and required evaluations, a comprehensive diagnostic list can be compiled. A definitive treatment plan can then be established to address these issues and other treatment options that may be available to allow the patient to make an informed decision as to the preferred treatment. The correction of dentofacial deformities often requires double jaw surgery to achieve a quality functional and aesthetic result as well as address the airway issues. An often ignored but important cephalometric and clinical interrelationship in the diagnosis and treatment planning for the correction of dentofacial deformities is the occlusal plane angulation.6,30-32 The occlusal plane angle is formed by the Frankfort horizontal plane and a line tangent to the cusp tips of the lower premolars and the buccal groove of the second molar. The normal value for adults is 8 +/- 4 degrees. An increased (high) occlusal plane angle usually is reflected in an increased mandibular plane angle (dolicocephaly), and a decreased (low) occlusal plane angle usually correlates with a decreased mandibular plane angle (brachycephaly). High Occlusal Plane Facial Type. Surgical Decrease of the Occlusal Plane. Maxillary incisor angulation increases (the same amount that the maxillary occlusal plane decreases). Mandibular incisor angulation decreases (the same amount that the mandibular occlusal plane decreases). Projection of the chin increases relative to the lower incisor edges. Posterior facial height may increase. Prominence of the mandibular angles may increase. Maxillary incisor edges move forward relative to the perinasal area. Incisal guidance and canine rise occlusion improves, and posterior working and non-working interferences are eliminated. 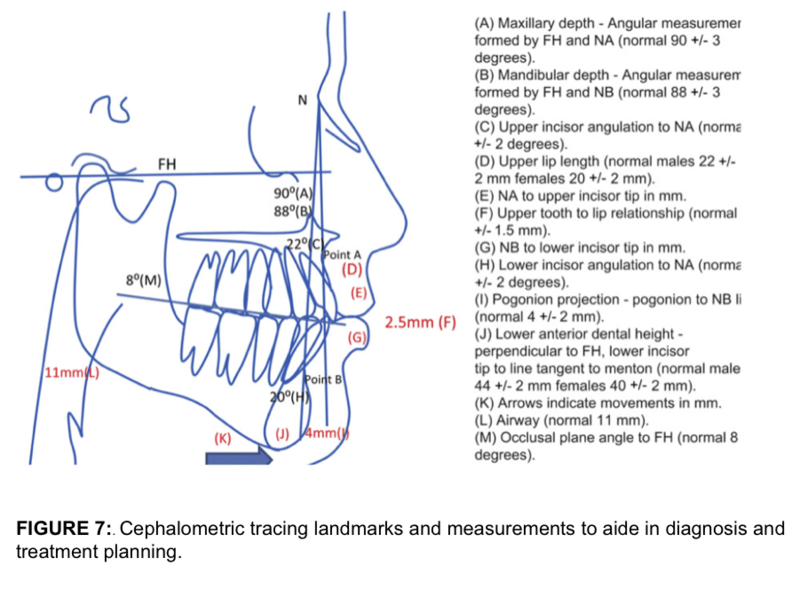 Treatment planning for C-TJR-OS cases is based on prediction tracing, clinical evaluation, and dental models, which provide the template for movements of the upper and lower jaws to establish optimal treatment outcome in relation to function, facial harmony, occlusion, and oropharyngeal airway dimensions. For patients who require total joint prostheses, a CT scan is acquired of the maxillofacial region that includes the TMJs, maxilla, and mandible with 1-mm overlapping cuts. Using these CT scan data, a stereolithic model is fabricated, with the mandible as a separate piece. 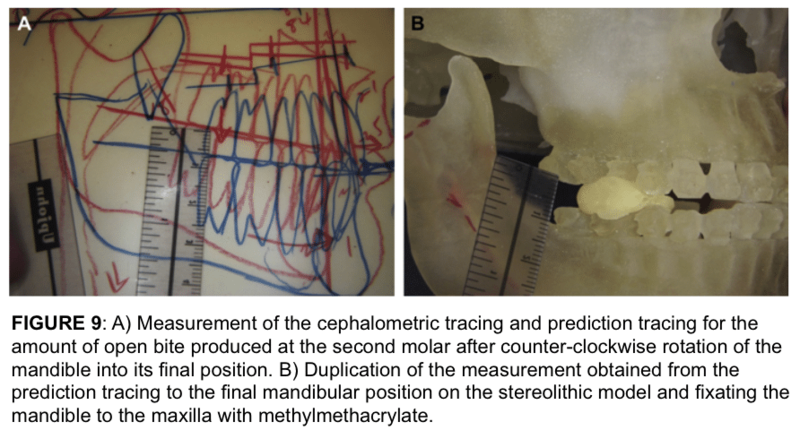 Using the original cephalometric tracing and prediction tracing (Fig. 9 A), the mandible on the stereolithic model is placed into its future predetermined position using the planned measurements for correction of mandibular antero-posterior and vertical positions, occlusal plane alteration, pitch, yaw, and roll (Fig. 9 B). The mandible is stabilized to the maxilla with quick-cure acrylic. Many patients with TM pathology requiring concomitant orthognathic surgery will benefit from counter-clockwise rotation of the maxillo-mandibular complex. Repositioning the mandible into its final position requires the development of posterior open bites on the model (Fig. 9 B). Because the mandibular position on the stereolithic models is established using hands-on measurements, the operator’s manual dexterity and 3-dimensional perspective play a critical role in setting the mandible in its proper and final position. This step can predispose the planning process to a certain margin of error. The next step requires condylectomies as well as preparation of the lateral aspect of the rami and fossae (Fig. 10 A, B) for fabrication of the patient-fitted total joint prostheses. The goal of this step is to recontour the lateral ramus to a relatively flat surface in the area where the mandibular component will be placed. The fossa requires recontouring only if heterotopic bone or unusual anatomy is present. The recontouring areas are marked in red for duplication of bone removal at surgery. Because most patients with TMJ problems requiring C-TJR-OS can benefit from counter-clockwise rotation of the maxillo-mandibular complex, the stereolithic model will likely be set with posterior open bites, because the maxilla is maintained in its original position. To accommodate the prosthesis, 20 mm of space is required between the fossa and ramus. Once the stereolithic model is finalized, the model is sent to TMJ Concepts (Ventura, CA) to perform the design, blueprint, and wax-up (Fig. 10 C) of the custom-fitted total joint prostheses for approval by the surgeon before manufacture of the prostheses. The period from CT acquisition to the manufacturer’s completion of the patient-fitted prostheses is approximately 8 weeks. The final prostheses (Fig. 10 D) are sent to the hospital for subsequent implantation. The numbers on the printout indicate the length of screw necessary for bicortical engagement. Prior to surgery, the surgical procedures are performed by the surgeon on articulator-mounted dental models. The mandible is repositioned on the articulator, duplicating the movements performed on the stereolithic model, and the intermediate splint is constructed. The maxillary model is repositioned, segmented if indicated, and placed into the maximal occlusal fit. Then, the palatal splint is constructed or occlusal splint if the surgeon prefers. Virtual Surgical Planning (VSP) utilized computer technology to simulate the planned surgical procedures. 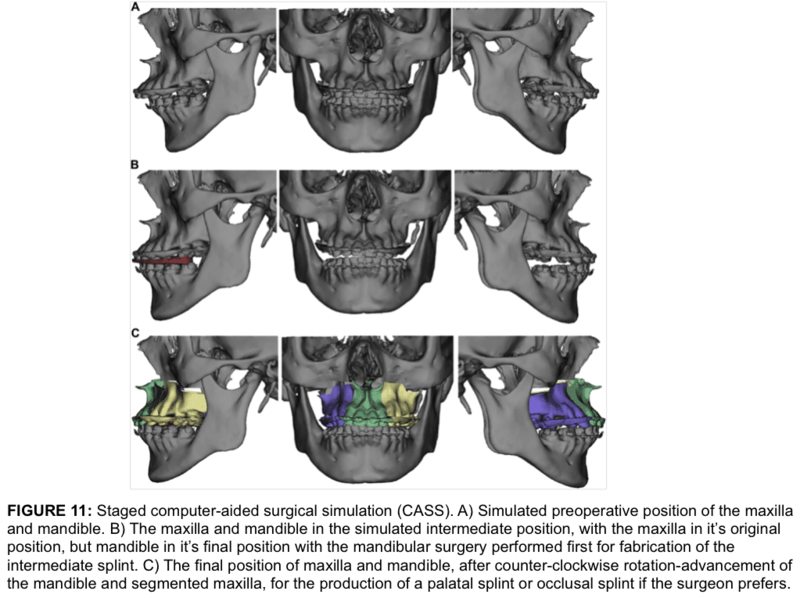 Over the past decade, computer-assisted surgical simulation (CASS) technology has been integrated to many maxillofacial surgical applications,35,36 including dentofacial deformities, congenital deformities, defects after tumor ablation, post-traumatic defects, reconstruction of cranial defects,37 and reconstruction of the TMJ.33,34 CASS technology applied to orthognathic surgery can improve surgical accuracy, provide intermediate and final surgical splints, and decrease the surgeon’s time input for presurgical preparation compared with traditional methods of case preparation. Data for VSP in orthognathic surgery cases can be obtained from high quality cone beam scans, but better quality simulation and accuracy can be acquired from medical grade CT scans of the jaws with 1-mm overlapping cuts. 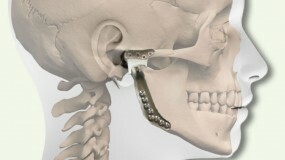 For C-TJR-OS cases, the orthognathic surgery can be planned using CASS technology and moving the maxilla and mandible into their final position in a computer-simulated environment (Fig.11 A, C). Using the computer simulation, the antero-posterior and vertical positions, occlusal plane alteration, pitch, yaw, and roll are accurately finalized for the maxilla and mandible based on clinical evaluation, dental models, prediction tracing, and computer-simulation analysis. Segmentation of the maxilla can be simulated. Using Digital Imaging and Communications in Medicine (DICOM) data, the stereolithic model is produced with the maxilla and mandible in the final position and provided to the surgeon for removal of the condyle and recontouring of the lateral rami and fossae if indicated. The stereolithic model is sent to TMJ Concepts for the design, blueprint, and wax-up of the prostheses. Via the Internet, the design is approved by the surgeon. Then, the custom-fitted total joint prostheses are manufactured (Fig. 12). It takes approximately 8 weeks to manufacture the total joint patient-fitted prostheses. Figure 12 demonstrates the basic design of the TMJ Concepts patient-fitted prosthesis. The black arrow points to the mesh framework on the underside of the custom-fitted titanium shell, that secures the polyethylene articulating portion of the fossa component. The yellow arrow points to the mesh on the superior surface of the fossa component that allows osseo-integration with the fossa bone. The red arrow points to the posterior stop of the fossa; a necessary component for mandibular advancement and stability. The green arrow shows the bony defect created from the counter-clockwise rotation of the posterior maxilla. These defects require bone or synthetic bone grafting for stability of the maxilla. Approximately 2 weeks before surgery, final dental models are acquired including 2 maxillary models if the maxilla is to be segmented or dental equilibration is required. One of the maxillary models is segmented if indicated, dental equilibration is performed, and the segments are placed in the best occlusion fit with the mandibular dentition and maxillary segments fixed to each other. The dental models do not require mounting on an articulator. The 3 or 4 models (2 maxillary and 1 mandibular, or 2 mandibular models if equilibrations or dentoalveolar surgery are done on the mandible) are physically sent to the VSP company for scanning and simulation into the computer model. Alternatively, with an i-CAT machine, the models can be scanned and digitally sent to the VSP company. Because the authors surgical protocol routinely performs the TMJ reconstruction and mandibular advancement with the TMJ Concepts total joint prosthesis first, the un-segmented maxillary model is simulated into the original maxillary position and the mandibular model is simulated into the mandible into its final position. The intermediate splint is constructed (Fig. 11, B; Fig. 13 A, B) Then the segmented maxillary model is simulated into the computer model in its final position, with the best occlusal fit with the mandibular occlusion, and the palatal splint is fabricated (Fig. 13 C, D) or an occlusal splint is made if the surgeons prefers. The dental models, splints, and images of the computer-simulated surgery are sent to the surgeon for implementation during surgery. Using CASS technology for C-TJR-OS cases eliminates the ‘‘traditional’’ steps requiring the surgeon to manually set the mandible into its new final position on the stereolithic model, thus saving time and improving surgical accuracy. Although dental model surgery is necessary only if the maxilla requires segmentation, the models do not require mounting on an articulator. This saves considerable time by eliminating the time required to mount the models, prepare the model bases for model surgery, reposition the mandible, construct the intermediate occlusal splint, and make the final palatal splint. With CASS technology, the splints are manufactured by the VSP company. Adjunctive procedures such as genioplasty, rhinoplasty, UPPP, facial augmentation, etc. A potential risk to patients receiving TMJ total joint prosthesis is infection. The occurrence rate is less than 2 % with greater risk for patients on immuno-supressant medications such rheumatoid patients or others with connective tissue/autoimmune diseases. Bacterial or viral contamination of the prosthesis can occur during surgery or develop at a later time from bacterial seeding through a hematogenic route or localized bacterial sources. As a result, strict adherence to sterile technique for the procedures performed can prevent or reduce the chance of infection associated with the implantation of total joint prosthesis, and concomitant orthognathic surgery. 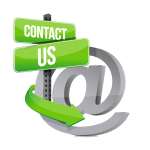 The TMJ Concepts prostheses use design principles and materials that are proven highly successful and are the gold standard in orthopedic joint reconstruction for hip and knee replacements. The prosthesis consists of a fossa component with a commercially pure titanium framework covered with a mesh and an ultra-high molecular weight polyethylene functional component fused to the mesh on the bottom side of the framework. The fossa component is attached to the lateral rim of the fossa with 4, 2 mm diameter screws. The mandibular component is composed of a titanium alloy shaft with a cobalt-chromium alloy head with the prosthesis secured to the mandibular ramus with 7 to 9, 2 mm diameter bicortical screws. The fossa and mandibular components osseo-integrate with the fossa and ramus respectively. 1) After surgical prepping including the face, neck, mouth, ears, ear canals, nose, endotracheal tube, and abdomen, the abdomen as well as the face and neck are draped, and the mouth and nose are isolated by application of a Tegaderm film dressing and the ear canal is gently packed with cotton (Figure 14 A). 2) The TMJs are approached through an endaural or pre-auricular incision to perform the condylectomy, joint debridement, and coronoidectomy (when the mandible is significantly advanced or vertically lengthened). The bone from the condylectomies and coronoidectomies is saved for use in grafting the bone defects that may be associated with the maxillary osteotomies. 3) Submandibular incisions are used to access the ramus to reflect off the masseter and medial pterygoid muscles as well as to mobilize the mandible in a downward and forward direction. The lateral aspect of the ramus is prepared duplicating the alterations on the stereolithic model. 4) The oral cavity is isolated by draping with sterile towels, exposing from commissure to commissure (Fig. 14 B). The Tegaderm is cut through and the oral cavity is entered. If the case includes bilateral total joint prostheses, then the intermediate splint is inserted and maxillo-mandibular fixation applied. If it is a unilateral total joint prosthesis case, then go to Step 5. 5) For unilateral total joint prosthesis, using separate instrumentation, a contralateral mandibular sagittal split osteotomy is performed and mandible mobilized on that side. The intermediate splint and maxillo-mandibular fixation are applied. Rigid fixation is placed to secure the mandibular segments and incision closed. 6) The surgeon changes gloves and gown and the mouth is sealed off once again with a Tegaderm film dressing. 7) The total joint prostheses are inserted and fixed in position. A stab incision can be made about 1 centimeter below the earlobe and a trocar inserted to place screws in the holes at the top of the prosthesis that are difficult to access from the submandibular incision. 8) The surgical areas are thoroughly irrigated with saline with a final rinse using betadine solution. The masseter muscles are reattached to the mandible and submandibular incisions closed. 9) Fat grafts are harvested from the abdomen or buttock with establishment of good hemostasis and closure of the incisions. A small drain can be inserted in the donor area if good hemostasis cannot be achieved. 10) The articulating area of the prostheses are thoroughly irrigated with saline through the endaural or preauricular incisions with a final rinse using betadine solution. The fat grafts are packed around the articulating area of the prostheses (Figure 15 A-D) and the incisions closed. 11) The oral cavity is then entered, maxillo-mandibular fixation released, and intermediate splint removed. 12) Maxillary osteotomies are performed and maxilla mobilized. Intranasal procedures are done such as turbinectomies and septoplasty if indicated. 13) The maxilla is segmented, palatal splint inserted and maxillo-mandibular fixation applied. The maxilla is rigidly fixated with 4 bone plates and bone grafting at the osteotomy sites as indicated. 14) The alar base cinch suture is placed and maxillary incision closed. 15) Bone screws or temporary anchoring devices (TADs) can be placed in the alveolar bone area if the surgeon prefers, so that the required post surgery interarch elastics to support the mandible and occlusion can be applied to these devices and not tooth born which could extrude or displace the teeth. 16) Any other adjunctive procedures can be performed such as genioplasty, rhinoplasty, etc. Special care must be taken, when performing a concomitant genioplasty procedure, using a conservative posterior dissection along the symphysis/body region to prevent communication with the total joint prosthesis implantation site. Appropriate IV antibiotics are used while in the hospital and then PO antibiotics for an additional 7 to 10 days. This patient management scheme should minimize the risk of infection. This 22-year-old female had the onset of TMJ problems at the age of 14 secondary to adolescent internal condylar resorption (AICR). She had previous orthodontics and double jaw orthognathic surgery at the age of 16, but the TMJ pathology was not addressed. The TMJ pathology continued to worsen. She presented with a significant relapse of both maxilla and mandible and development of a Class II anterior open bite (Fig. 16 A-C, 17 A-C, 18 A). She also had hypertrophied turbinates with nasal airway obstruction. Pre surgery her TMJ pain was 8 (0 = no pain or no limitations; 10 = worse pain imaginable or total loss of function), Headaches 5, Jaw Function 5, Diet 5, and Disability 8. Incisal opening was 48 mm, but only 32 mm without significant pain. Cone Beam CT (Fig 19) shows advanced arthritis with severe condylar resorption compatible with advanced AICR. 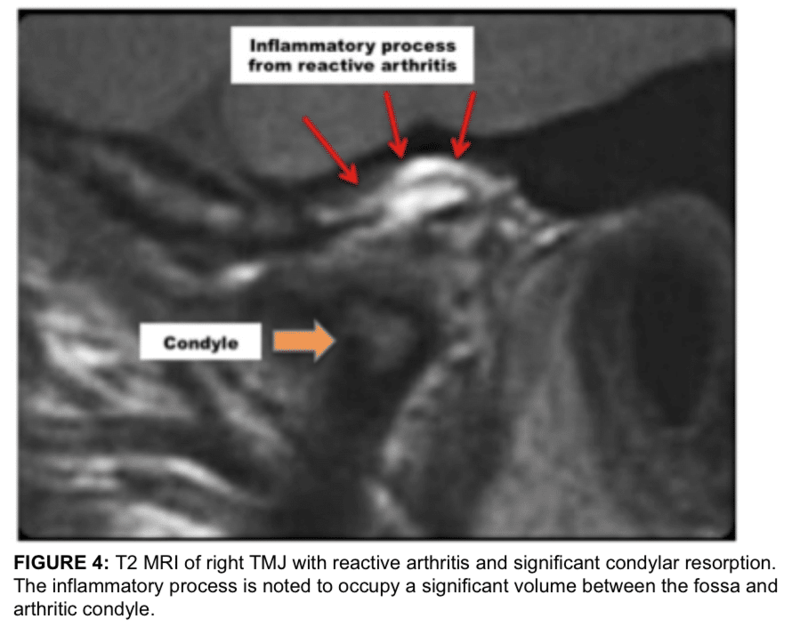 Presurgical MRI (Fig 20) shows the arthritic changes in the joints and the severely degenerated articular discs rendering them non-salvageable, thus, the necessity for patient-fitted TMJ Concepts total joint prostheses to reconstruct the TMJs and advance the maxillo-mandibular complex in a counter-clockwise direction. The patient underwent the following surgical procedures: (1) Bilateral TMJ reconstruction and counter-clockwise rotation-advancement of the mandible 18 mm with TMJ Concepts total joint prostheses, (2) Multiple maxillary osteotomies to counter-clockwise rotate and advance 8 mm (Fig. 18 B), (3) Bilateral mandibular coronoidotomies, (4) Bilateral TMJ fat grafts (harvested from the abdomen), and (5) Bilateral partial inferior turbinectomies. At 3 years post surgery she has a stable skeletal and occlusal relationship, improved facial balance, and good airway (Fig. 16 D-F, 17 D-F). 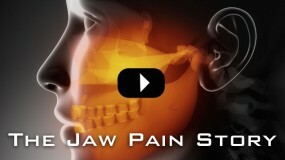 TMJ pain 0, Headaches 0, Jaw Function 1, Diet 1, Disability 0, and Incisal opening of 45 mm. This 15 year-old patient (Figures 21 A-C, 22 A-C, 23 A) developed severe juvenile idiopathic arthritis, diagnosed at age 11 years with milder effects in multiple other joints, had severe sleep apnea, but was relatively pain free. Incisal opening was 42 mm. Multiple maxillary osteotomies to move the anterior aspect upward and posterior aspect downwards. Genioplasty with a 14 mm alloplastic implant. The traditional C-TJR-OS protocol was used to prepare this case for surgery with the surgery performed on the sterolithic model by the surgeon for manufacture of the TMJ total joint prostheses, then duplicated on the articulator mounted dental models for construction of the intermediate and final palatal splints. With the counter-clockwise rotation of the maxillo-mandibular complex and the genioplasty, pogonion advanced forward 42 mm. The patient is seen at 1-year post surgery (Figures 21 D-F, 22 D-F) with good facial balance, no pain, skeletal and occlusal stability, and an incisal opening of 33 mm. At the age of 37 years (22 years and 3 months post surgery), she maintains good facial balance and stability, no pain, and an incisal opening of 37 mm with no dietary limitations (Figures 21 G-I, 22 G-I). Early on in the use of total joint prostheses, a common problem encountered in approximately 35% of the patients, was post surgical fibrosis and heterotopic bone formation around the prostheses causing jaw dysfunction, decreased incisal opening, and pain.40 In 1992, Wolford developed a technique to place fat grafts (harvested from the abdomen or buttock) around the articulating area of the total joint prosthesis to eliminate the dead space. This prevents blood clot formation in the space around the prosthesis that could provide a matrix for fibrous ingrowth and pluri-potential cells migrating into the area that could develop heterotopic bone and dense fibrotic tissues. Also, in patients with previous failed alloplastic implants, the fat graft blocks out a large area in which the foreign body giant cell reaction and reactive bone may otherwise redevelop. Wolford et.al.40-42 have demonstrated the improved outcomes for patients using fat grafts packed around the prostheses compared to patients that did not receive the fat grafts relative to function, pain, and elimination of additional surgical procedures for joint debridement. Mercuri et.al.43 reported the efficacy of the fat grafts packed around the prostheses in TMJ ankylosis cases. Dela Coleta et.al.44 evaluated 47 female patients for surgical stability following bilateral TMJ reconstruction using TMJ Concepts patient-fitted TMJ total joint prostheses, TMJ fat grafts, and counter-clockwise rotation of the maxillo-mandibular complex with Menton advancing an average of 18.4 mm and the occlusal plane decreasing an average of 14.9 degrees. Average follow-up was 40.6 months. Results demonstrated minor maxillary horizontal changes while the mandibular measurements remained very stable. Pinto et.al.45 evaluated the same 47 female patients relative to pain and dysfunctional outcomes. Patients were divided into 2 groups based on the number of previous surgeries: Group 1 had 0-1 previous surgeries while Group 2 had 2 or more previous surgeries. Significant improvements (37–52%) were observed for TMJ pain, headaches, jaw function, diet, and disability. MIO increased 14%. Group 1 patient had better pain and jaw function results than Group 2 patients. For patients who did not receive fat grafts around the prostheses and had previous failure of PT-SR TMJ implants, more than half required secondary surgery including TMJ debridement for removal of FBGCR, fibrosis, and/or heterotopic bone formation. These 2 studies demonstrated that end-stage TMJ patients could be treated in one operation with TMJ Concepts patient-fitted TMJ total joint prostheses, fat grafts, and maxillo-mandibular counter-clockwise rotation, for correction of an associated dentofacial deformity with good stability and improvement in pain and TMJ function. Although the life expectancy of this device is unknown, Wolford, Mercuri, et.al.46 recently published a 20-year follow-up study of 56 patients who had received the Techmedica total joint prostheses between 1989 and 1993 (see Case 2). There were statistically significant improvements in all parameters including incisal opening, jaw function, TMJ pain, and diet, with 85.7% of the patients reporting significant improvement in their quality of life. The greater the number of previous TMJ surgeries, patients reported a lower degree of subjective improvement, but they did report increased objective mandibular function and improved quality of life. There were no reports of device removal due to material wear or failure. Wolford et.al.20-24,44-53, Mercuri et.al.22,24,46,54-60 and others61-64have published numerous studies in reference to outcome data using TMJ total joint prostheses. A summary of these publications have produced the following facts in reference to the TMJ Concepts total joint prostheses: 1) TMJ Concepts prostheses are superior to autogenous tissues for end-stage TMJ reconstruction relative to subjective and objective outcomes23,47,57,58,60; 2) After 2 previous TMJ surgeries, autogenous tissues have a very high failure rate, whereas patient-fitted total joint prostheses have a high success rate23,46,59,60; 3) No donor site morbidity; 4) Increased number of previous TMJ surgeries produces a lower level of improvement related to pain and function outcomes compared to patients with 0 to 1 previous TMJ surgeries 21-24,45-47,52-60; 5) Failed TMJ alloplastic reconstruction (i.e. P/T, Silastic, metal-on-metal articulation, etc.) can create a foreign-body giant-cell reaction and/or metallosis, best treated by joint debridement and reconstruction with patient-fitted total joint prostheses21-24,45-47,50,53,56; 6) Fat grafts packed around the articulating area of the prostheses improves outcomes relative to decreased pain, improved jaw function, and decreased requirement for repeat surgery 40-43; 7) Osseo-integration of the TMJ Concepts fossa and mandibular components occur and is important for long-term stability 20,22-24,44,45-47,51-55; 8) Posterior stop on the fossa component is important to stabilize the joint, jaw position, and occlusion 20,23,21,44,45,51,52; 9) Concomitant orthognathic surgery can be performed at the same time as the TMJs are reconstructed 20,23,21,44,45,51,52; and 10) 20-year follow-up study 46 demonstrated improvements in pain, jaw function, diet, incisal opening, and quality of life. Although there are individual variations, females usually have the majority of their facial growth (98%) complete by the age of 15 years and males by the age of 17 to 18 years. 65 Predictability of results and limiting correction of the jaw and TMJ pathology related deformities to one major operation can best be achieved by waiting until growth is relatively complete if only the TMJ total joint prostheses are placed without maxillary surgery, particularly if only a unilateral prosthesis is required. However, there are definite indications for performing surgery during the growing years such as progressive TMJ deterioration, ankylosis, masticatory dysfunction, tumor removal, pain, sleep apnea, etc. Performing surgery during growth may result in the need for additional surgery at a later time to correct a resultant deformity and malocclusion that may develop during the completion of growth. Additional surgery is a greater probability with unilateral prosthesis and a normal contralateral TMJ if surgery is performed during the growing years. 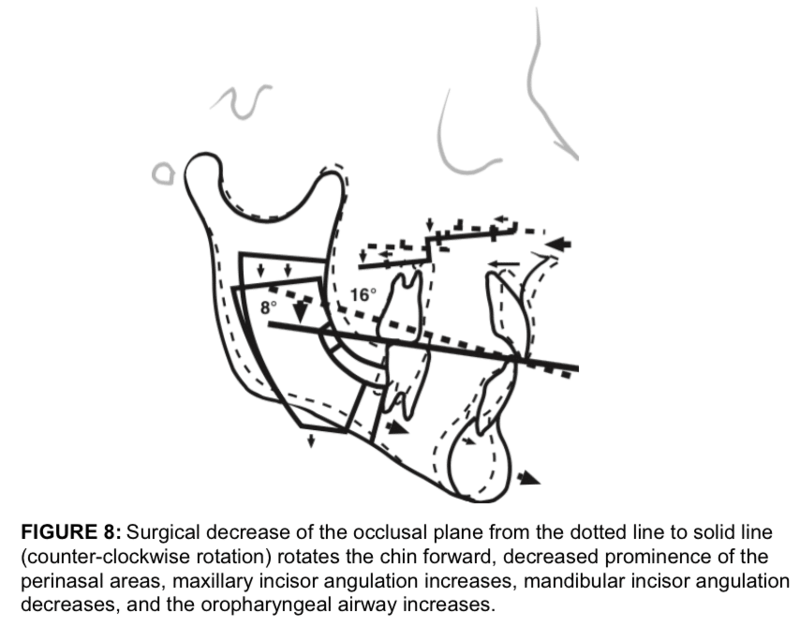 In addition, some orthognathic surgical procedures have a profound affect on subsequent facial growth and development including maxillary Le Fort I osteotomies, where maxillary A-P growth is stopped, but the vertical alveolar growth of the maxilla and mandible continues contributing to a downward and backward rotation vector of facial growth, but the occlusion should stay together. Therefore, bilateral TMJ patient-fitted total joint prostheses and maxillary osteotomies can be done at an earlier age with predictable results. 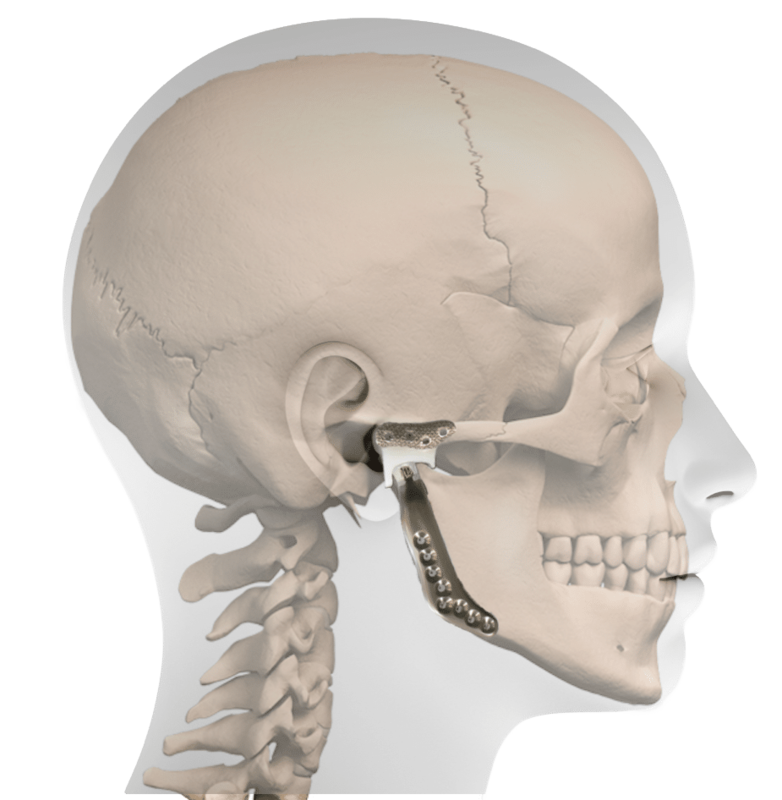 If repeat orthognathic surgery is required at a later time, the advancement of the mandible with the TMJ total joint prosthesis can be accomplished by one of 4 surgical options: 1) Intraoral ramus sagittal split osteotomy, 2) Extraoral sagittal split ramus osteotomy (ESSRO), 3) Advance the mandible forward relative to the prosthesis by removing the screws from the mandibular component, separate it from the ramus, advance the mandible along the patient-fitted prosthesis and re-fixate the prosthesis with bone screws to the mandible in its new position, or 4) Replace the mandibular component of the total joint prosthesis with a new longer mandibular component that would be reattached to the mandibular ramus after the mandible is moved into its new position. We have previously published on maxillary and mandibular orthognathic surgery and the effects on growth, with guidelines for age considerations for surgical intervention66-68 as well as TMJ surgery effects on facial growth.69 We have successfully treated juvenile idiopathic arthritis (JIA) patients (ages 12–14 years and older) with the protocol described above in one stage with good functional and esthetic results without requiring secondary procedures.20 These cases are predictable when performed at age 13 years or older in females and 15 years or older in males. However, the vector of facial growth will change in younger patients to a downward and backward direction. Healthy and stable TMJs are necessary for quality treatment outcomes in orthognathic surgery. If the TMJs are not stable and healthy, orthognathic surgery results may be unsatisfactory relative to function, esthetics, skeletal and occlusal stability as well as pain. The oral and maxillofacial surgeon should be suspicious of possible TMJ problems in the following types of patients: 1) High occlusal plane angle facial morphologies with retruded maxilla and mandible; 2) Class II high occlusal plane angle and retruded mandibular morphological type, particularly those with anterior open bites; 3) Progressively worsening Class II occlusal and jaw relationship; 4) Facial asymmetry, particularly with progressive worsening; and 5) Patients reporting headaches, TMJ pain, myofascial pain, history of clicking and popping of the TMJs, and/or ear symptoms. The surgeon should not ignore these symptoms. With one or more of these symptoms, patients should be evaluated for possible TMJ pathology. 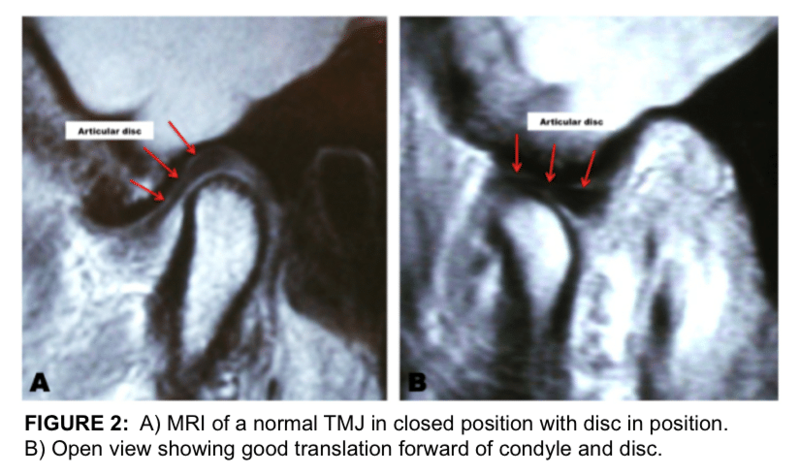 An MRI of the TMJs can aide in identification of the specific TMJ pathology. Failure to recognize and treat these conditions can result in significant relapse, increased pain, and a greater complexity of subsequent treatment. During the past 25 years, major advancements have been made in TMJ diagnostics and the development of surgical procedures to treat and rehabilitate the pathological, dysfunctional, and painful TMJ. Research has clearly demonstrated that TMJ and orthognathic surgery can be safely and predictably performed at the same operation, but it does necessitate the correct diagnosis and treatment plan, as well as requires the surgeon to have expertise in both TMJ and orthognathic surgery. The surgical procedures can be separated into 2 or more surgical stages, but the TMJ surgery should be done first. With the correct diagnosis and treatment plan, combined TMJ and orthognathic surgical approaches provide complete and comprehensive management of patients with co-existing TMJ pathology and dentofacial deformities. 1. Wolford LM, Cassano DS, Goncalves JR. Common TMJ disorders: orthodontic and surgical management. In: McNamara JA, Kapila SD, editors. Temporomandibular disorders and orofacial pain: separating controversy from consensus, vol. 46. Ann Arbor (MI): Craniofacial Growth Series. The University of Michigan; 2009. p. 159–98. 3. Wolford LM, Dhameja A: Planning for Combined TMJ Arthroplasty and Orthognathic Surgery. 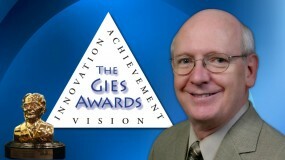 Ness GM (Guest Ed. ), Atlas of the Oral and Maxillofacial Clinics of North America. WB Saunders Co. Philadelphia, pp. 243- 270, 2011. 4. Wolford LM: Mandibular Asymmetry: Temporomandibular Joint Degeneration. In Bagheri SC, Bell RB, Khan HA (Eds), Current Therapy in Oral and Maxillofacial Surgery. Elsevier Saunders, St. Louis, pp. 696-725, 2012. 5. Wolford LM, Reiche-Fischel O, Mehra P. Changes in temporomandibular joint dysfunction after orthognathic surgery. J Oral and Maxillofacial Surg. 2003 Jun;61(6):655-60; discussion 661. 6. Wolford LM: Surgical Planning in Orthognathic Surgery (Chapter 60). In Booth PW, Schendel SA, Hausamen JE (Eds), Maxillofacial Surgery Volume 2. Churchill Livingstone, St Louis, MO, 2007, pp. 1155-1210. 7. Goncalves JR, Gomes LCR, Vianna AP, Rodrigues DB, Concalves DAG, Wolford LW: Airway Space Changes after Maxillomandibular Counterclockwise Rotation and Mandibular Advancement with TMJ Concepts Total Joint Prostheses: Three-Dimensional Assessment. Int J Oral Maxillofac Surg 42:1014-1022, 2013. 8. Wolford LM, Perez D, Stevao E, Perez E: Airway Space Changes After Nasopharyngeal Adenoidectomy in Conjunction with Le Fort I Osteotomy. J Oral Maxillofac Surg 70:665-671, 2012. 9. Coleta KE, Wolford LM, Gonçalves JR, Pinto AS, Cassano DS, Gonçalves DA: Maxillo-mandibular counter-clockwise rotation and mandibular advancement with TMJ Concepts total joint prostheses: part II–airway changes and stability. Int J Oral Maxillofac Surg. 2009 Mar;38(3):228-35. Epub 2009 Jan 9. 25. Movahed R, Morales-Ryan C, Allen WR, Warren S, Wolford LM: Outcome Assessment of 603 Cases of Concomitant Inferior Turbinectomy and LeFort I Osteotomy. Bayl Univ Med Cent Proc 26:376–381, 2013. 26. Linder-Aronson S. Adenoids. Th eir eff ect on mode of breathing and nasal airflow and their relationship to characteristics of the facial skeleton and the dentition. A biometric, rhino-manometric and cephalometro-radiographic study on children with and without adenoids. Acta Otolaryngol Suppl 1970;265:1–132. 27. Harari D, Redlich M, Miri S, Hamud T, Gross M. Th e eff ect of mouth breathing versus nasal breathing on dentofacial and craniofacial development in orthodontic patients. Laryngoscope 2010;120(10):2089–2093. 28. Hultcrantz E, Larson M, Hellquist R, Ahlquist-Rastad J, Svanholm H, Jakobsson OP. The influence of tonsillar obstruction and tonsillectomy on facial growth and dental arch morphology. Int J Pediatr Otorhinolaryngol 1991;22(2):125–134. 29. Schendel SA, Eisenfeld J, Bell WH, Epker BN, Mishelevich DJ. The long face syndrome: vertical maxillary excess. Am J Orthod 1976;70(4):398–408. 33. 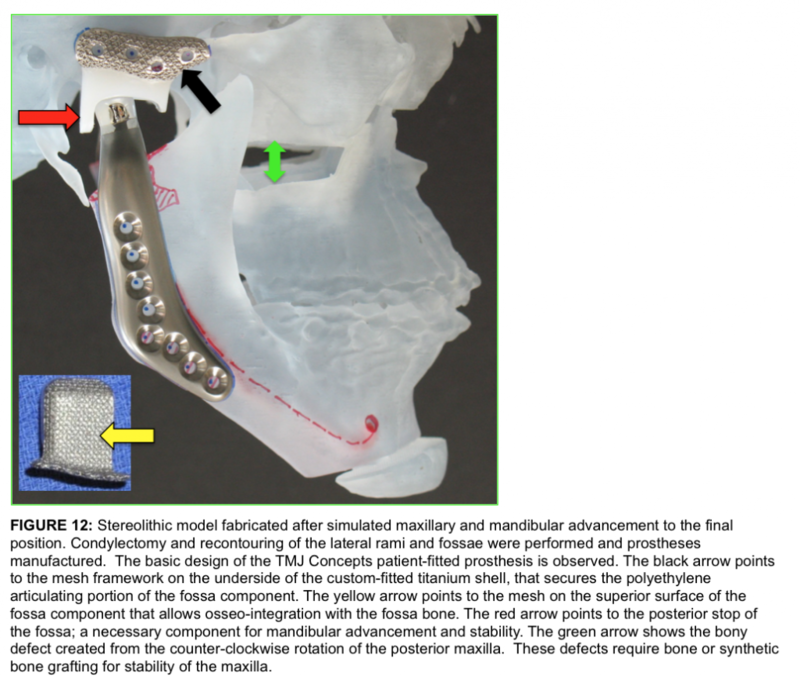 Movahed R, Teschke M, Wolford LM: Protocol for concomitant Temprormandibular Joint Custom-Fitted Total Joint Reconstruction and Orthognathic Surgery Utilizing Computer-Assisted Surgical Simulation. J Oral Maxillofac Surg 71:2123-2129, 2013. 34. Movahed R, Wolford LM: Protocol for concomitant Temporomandibular Joint Custom-Fitted Total Joint Reconstruction and Orthognathic Surgery Using Computer-Assisted Surgical Simulation. Oral and Maxillofacial Surgery Clinics of North America, 27(1):37-46, 2015. 38. Wolford LM: Postsurgical Patient Management. In Fonseca, Marciani, Turvey, Volume III, Oral and Maxillofacial Surgery, Second Edition, Chapter 19, pp. 396-418, 2008. 39. Wolford LM, Rodrigues DB, Limoeiro E: Orthognathic and TMJ Surgery: Postsurgical Patient Management. J Oral Maxillofac Surg 69:2893-2903, 2011. 40. Wolford LM, Karras SC: Autologous fat transplantation around temporomandibular joint total joint prostheses: preliminary treatment outcomes, J Oral Maxillofac Surg 55:245-251, 1997. 41. Wolford LM, Morales-Ryan CA, Garcia-Morales P, Cassano DS. Autologous fat grafts placed around temporomandibular joint (TMJ) total joint prostheses to prevent heterotopic bone. Baylor Univ Med Center Proc 2008; 21:248–254. 42. Wolford LM, Cassano DS: Autologous Fat Grafts Around Temporomandibular Joint (TMJ) Total Joint Prostheses to Prevent Heterotopic Bone. In M.A. Shiffman (Ed.) Autologous Fat Transfer. Springer-Verlag Berlin Heidelberg: 2010. pp. 361-382. 49. Wolford LM, Pitta MC, Reiche-Fischel O, Franco PF: TMJ Concepts/Techmedica custom-made TMJ total joint prosthesis: 5-year follow-up study. Int J Oral Maxillofac Surg 32:268, 2003. 50. Franco PF, Talwar RM, Wolford LM: Unilateral TMJ Total Joint Reconstruction and the effects on the Contralateral Joint. AAOMS 79th Annual Meeting and Scientific Sessions. J Oral Maxillofac Surg 55:113, 1997. 51. Wolford LM, Bourland TC, Rodrigues D, Perez DE, Limoeiro E: Successful Reconstruction of Non-Growing Hemifacial Microsomia Patients With Unilateral Temporomandibular Joint Total Joint Prosthesis and Orthognathic Surgery. J Oral Maxillofac Surg 70:2835-2853, 2012. 54. Mercuri LG, Edibam NR, Giobbie-Hurder: Fourteen-year follow-up of a patient-fitted total temporomandibular joint reconstruction system. J Oral Maxillofac Surg Jun; 65(6):1140-8, 2007. 55. Mercuri LG, Giobbi-Hurder A; Long Term Outcomes After Total Alloplastic TMJ Reconstruction Following Exposure to Failed Materials. J Oral Maxillofac Surg, 62:1088-1096, 2004. 56. Mercuri LG: Subjective and Objective Outcomes for Patients Reconstructed with a Patient-Fitted Total Temporomandibular Joint Prosthesis. J Oral Maxillofac Surg 57:1427-1430, 1999. 57. Mercuri LG: The TMJ concepts patient fitted total temporomandibular joint reconstruction prosthesis. Oral Maxillofac Surg Clin North Amer 12: 73, 2000. 58. Mercuri LG: The use of alloplastic prostheses for temporomandibular joint reconstruction. J Oral Maxillofac Surg 58:70, 2000. 59. Mercuri, LG: Temporomandibular Joint Reconstruction. In, Oral and Maxillofacial Surgery. Fonseca, R (Ed). Elsevier. Philadelphia. Chapter 51: 945-960, 2008. 60. Mercuri, LG: End-Stage TMD and TMJ Reconstruction. In, Peterson’s Principles of Oral & Maxillofacial Surgery. 3rd Edition. Miloro M, Ghali G, Larsen P and Waite P (Eds). PMPH, USA Ltd. Chapter 52: 1173-1186, 2012. 61. Giannakopoulos, Sinn, Quinn: Biomet Microfixation TMJ replacement system: a 3-year follow-up study of patients treated during 1995 to 2005. J Oral Maxillofac Surg. 70:787-794, 2012. 63. Sidebottom AJ, Gruber E: One-year prospective outcome analysis and complications following total replacement of the TMJ with the TMJ Concepts System. Br J Oral Maxillofac Surg. 2013, 51:620-624. 64. Murdock B, Buchanan J, Cliff J : TMJ replacement: A New Zealand perspective. Int J Oral Maxillofac Surg 2014, 43:595-599. 65. Riolo ML, Moyers RE, McNamara JA, Hunter WS. An Atlas of Craniofacial Growth: Cephalometric Standards from the University School Growth Study, The University of Michigan. Ann Arbor, MI: University of Michigan,1974:105–106. 68. Wolford LM, Rodrigues DB: Orthognathic Considerations in the Young Patient and Effects on Facial Growth. In Preedy VR (ED) Handbook of Growth and Growth Monitoring in Health and Disease. Springer, New York, pp1789-1808, 2012. 69. Wolford LM, Rodrigues DB: Temporomandibular Joint (TMJ) Pathologies in Growing Patients: Effects on Facial Growth and Development. In Preedy VR (ED) Handbook of Growth and Growth Monitoring in Health and Disease. Springer, New York, pp 1809-1828, 2012.